Success comes from sifting, sorting and stitching little things together. Here is an actual example of that. A few years ago, I bought a futurist called Harry S Dent to Australia for a series of seminars. Here is a list of just some of the things I did to make those events the roaring success it was. There you go, that’s pretty much the template for a multi-million 2 day event. Certainly, there was no luck involved, there was no random acts, it was planned from beginning to end. Of course, that’s not how most people do things. Another important reason why random acts don’t work is because your prospects or your clients don’t wake up in the morning waiting to receive something from you, you are not even on their radar. They have got a lot going on, there is bills to pay, there are kids to feed, there is a business to run, someone’s breaking into the local ATM and the shopping centre down the road is on fire. The truth is they don’t even feel the breeze of your random act, it needs to be more sophisticated than that particularly today with all the clutter and noise in the marketplace. So, a great way to stand out is to be in “contact with them” repetitively. If it is not random acts, what is it then? 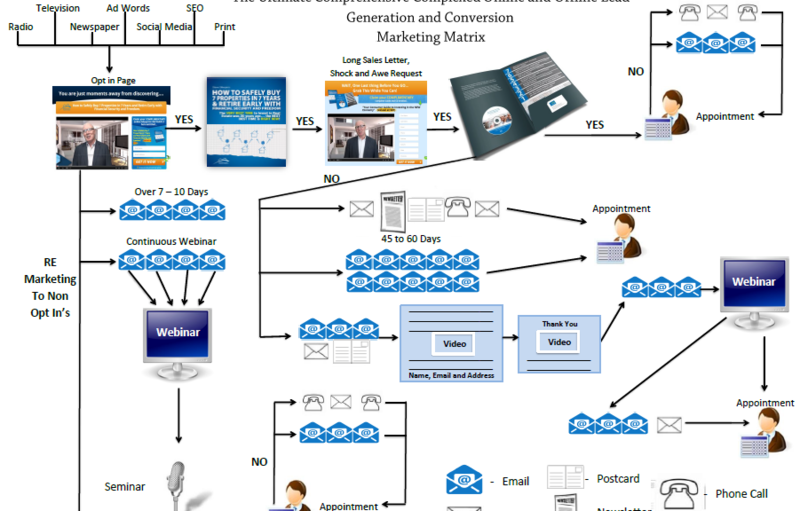 There is a name for this… It’s called a “Marketing Matrix” and here is a sample of one I created for a client years ago. Now trust me, if you have got one of these and you even showed it to your competitors, they would run out of the door at the first opportunity simply because they don’t want to do what it takes, even when it’s landed in their lap, to be successful. So the good news is having a marketing matrix bullet proof’s your business and income for life. Smart people are willing to have and create COMPLEX systems, COMPLEX processes, COMPLEX answers to COMPLEX objectives. I know there is a bit of work involved in doing this, in fact I have just done it for a new business I am involved in with roaring success I might add, my point is the reward is worth the work and your bank account will reflect that.